The division develops technology with a range of partners – encompassing government and non-governmental organizations, as well as the corporate sector. Here are three top picks from the event – a drone, a state of the art dynamic map, and a Star Trek-style translation device. Developed by Andover, Mass.- based Physical Sciences, the Instant Eye aerial drone is designed to improve situational awareness during disaster response efforts. The GPS-enabled Unmanned Aerial Vehicle (UAV) has two high-resolution cameras to provide real-time video of an area. It can deploy to help locate survivors, identify viable roads, and evaluate damage in disaster zones. The Army Research Laboratory, Combating Terrorism Technical Support Office, and the Defense Department’s Emerging Capabilities and Prototyping Office funded the UAV’s development. The UAV travels up to 50 miles per hour and can provide an “instant eye” on an area for up to 30 minutes. The quad-rotor design and reflexive autopilot and sensors mean it can perform in windy environments. The 8-inch custom carbon fiber frame makes it robust for extreme conditions. Instant Eye can carry up to a pound so it could deliver urgent medicine or several cell phones to enable communication in areas where access has become difficult. In July, Instant Eye also received FAA approval to fly in U.S. airspace to inspect critical infrastructure like power lines and pipelines. In the 2010 Haiti earthquake or the 2004 Thailand tsunami, the GeoSHAPE tool would have been invaluable. GeoSHAPE allows international organizations, militaries and local first responders to create, edit and share disaster-related data on an integrated dynamic map. In near real time, it can provide critical data on damage and available resources. As soon as a connection is established, the map is synchronized. What sort of data can the GeoSHAPE map provide? In addition to the information provided by a physical map, such as the location of hospitals and roads, it can also show up-to-date data on the current capacity of hospitals and the condition of roads. It can also show helicopter landing zones, food, water, and medical supplies, as well as the movements of support personnel. The map can be updated and seen by authorized users from anywhere in the world. Arbiter, GeoSHAPE’s mobile app, lets response personnel capture data and photos in the field and upload them to the map. Synchronized mapping helps different responder teams better coordinate and provide a more effective, faster, response. Responding to disasters around the world requires communicating in foreign languages. The SQU.ID SQ 410, a ruggedized, hands-free, eyes-free translation device frees up the user to concentrate on the task at hand. 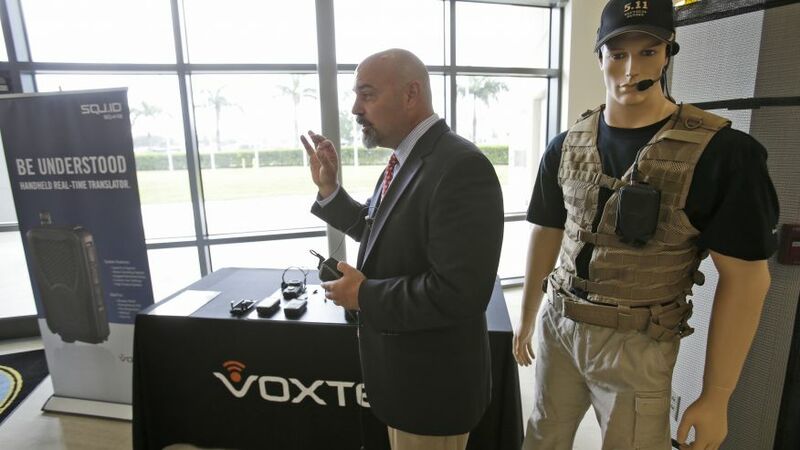 Made by Annapolis, Md.-based Voxtec, the compact device is about five inches by three inches and weighs only 10 ounces. It has more than eight hours of battery life and a glove-friendly interface that’s extremely handy for disaster responders. Voxtec has a library of 70 languages – ranging from Indonesian and French to Mandarin and Urdu. The device does not need to be connected to a network to operate, which is handy in a disaster zone where power and connectivity can be very limited. The device also doesn’t need to be trained and learn to understand your voice. This means that a medic or other emergency personnel can simply speak into the microphone and within moments the device uses its speaker to convey the translation in the required language.